I’d never even looked at a ski slope before I rocked up to Ruka on a bus full of thiry-odd other Erasmus students, geared up for a weekend of skiing and snowboarding. The cabins that greeted us were cosy and the views were incredible – snow and trees for miles, blanketed by a peaceful, unspoiled quiet. 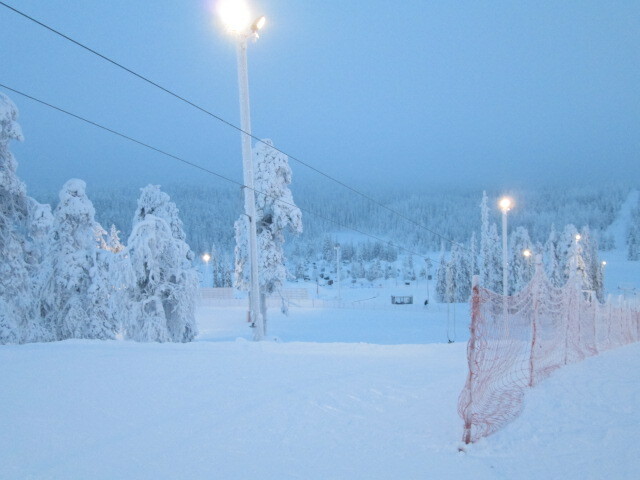 It was a Christmas fairy-land meets remote village meets sporting community. 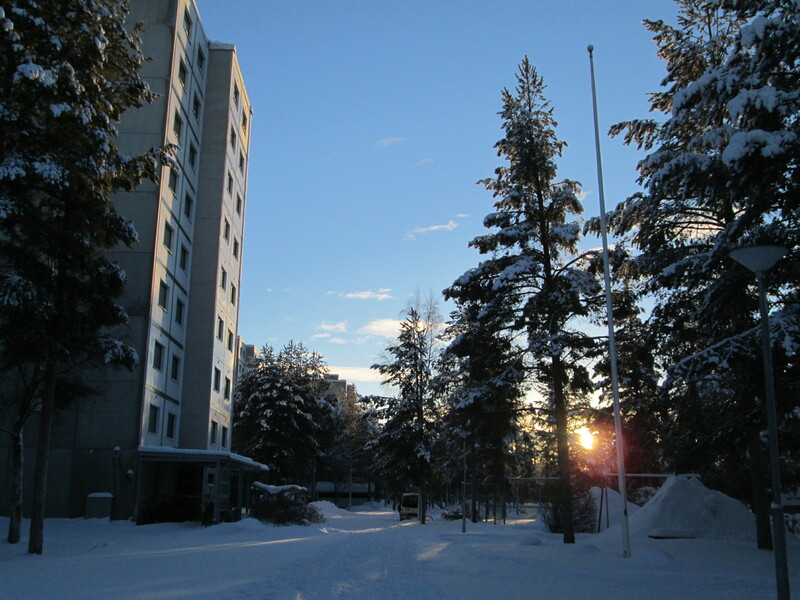 In two days I learnt to ski, snowboard and experience a real ESN Oulu outing and it was one of the most challenging weekends of my stay in Oulu. As one of the largest ski resorts in Finland, Ruka is located in Kuusamo, only an hour’s flight from Helsinki and easily accessible by road (albeit a long one). 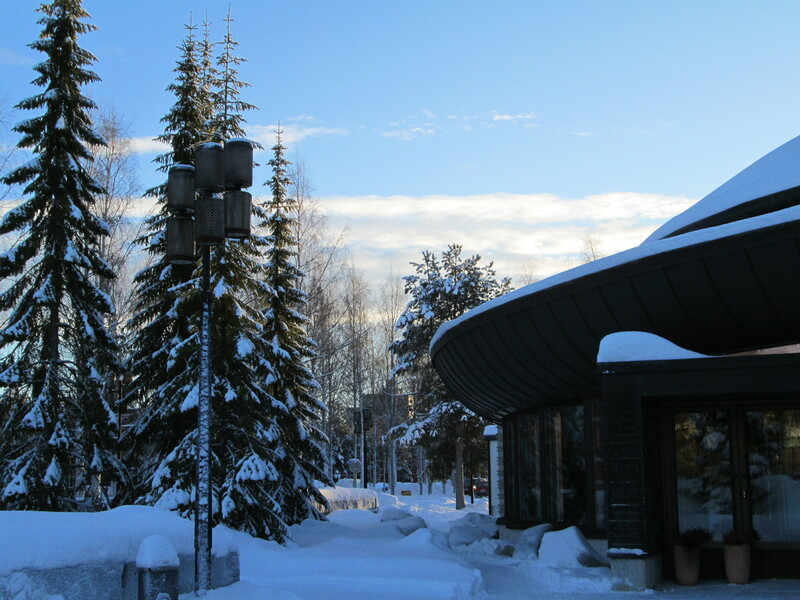 At the resort there are as many as 21 ski lifts, 2 ski shops, a bowling alley, 28 restaurants and bars and miles of the stunning Finnish countryside. This place has it all. 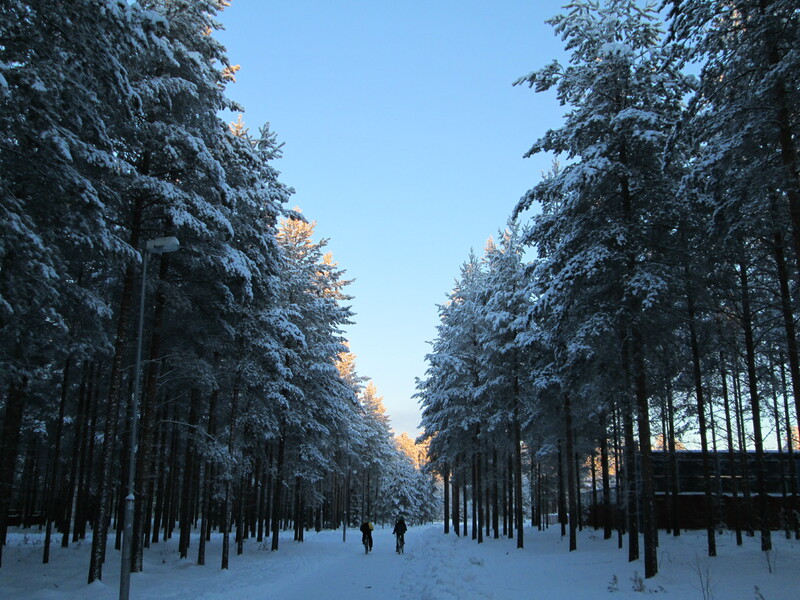 As well as a variety of skiing and snowboarding routes there are also opportunities for cross-country skiing, husky safaris, ice karting and snow shoe walking. You’re really spoilt for choice here and it’s not restricted to the winter season – there’s plenty to do in the summer. 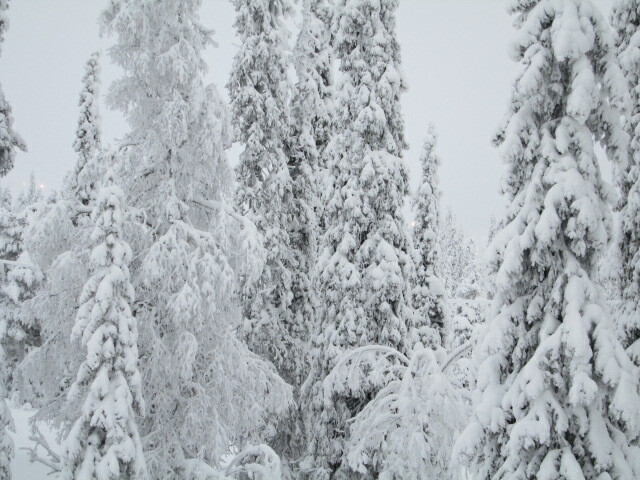 You can read more about what Ruka has to offer here. 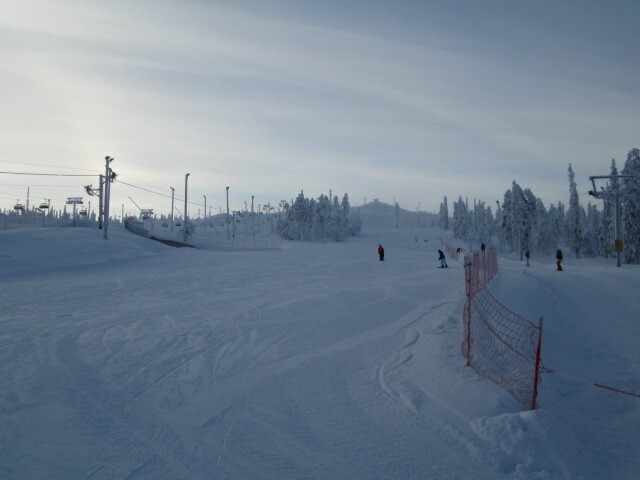 If you’ve never gone skiing before I would recommend that you let go of your fear, inhale the fresh air and go for it. And maybe get some lessons too. That’s what I did on our first morning; I joined three other students who had never skied before and met Pekka, my wise but friendly instructor. He took us away from all the professional adults and overconfident teenagers chasing each other down the mountain and led us to the slightly more relaxed children’s area. Comical penguins and elves lined the slopes, cheering us on. It was fairly easy to get the hang of skiing – keep your feet straight, make the ‘plow’ shape when you want to stop, hold a good posture. I thought I had my technique down and was feeling cold but confident. I ran back for a peanut butter sandwich lunch, keen to get onto a real slope. A proper slope. Now, had I been smart I might have opted for the ‘in-betweeny’, middle-sized slope for people just starting out, but instead I eagerly hopped into a ski lift and zoomed up the mountainside. The view, by the way, was incredible, but sadly I didn’t take my camera for fear of crushing it. I alighted at the top, gazed around in awe, and then felt my heart jump into my mouth. I had to go down. The only way down was to ski. Down. A hill. A really big hill. After some dithering and panicking I went for it and pushed away with my poles – it was great, I was flying! The only problem was that I couldn’t find the brakes! All my lessons in stopping fell from my head as I panicked and tried to avoid swerving into innocent children and happy couples enjoying their day. There I was zooming down a mountain like a train with no driver! After an age I reached the bottom and a flat surface but my legs wouldn’t stop shaking! On my second attempt I had a big fall and thought that it was the end of my skiing career – which was unlucky, because I was still midway down a slope, but luckily two friendly French guys helped me down and I passed the rest of the afternoon on the nice steady easy slopes with some friends. The next day, sore and battered, I was ready to try my hand at snowboarding – another first. Although I fell many more times than the previous day I enjoyed it so much more and felt a lot more confident than with skis. This time, however, I stuck to the nice ‘in-betweeny’ slopes and didn’t have any major disasters. Only minor squabbles with the ski lift to take me up – instead of sitting in a car I had to hold onto a pole and let it drag me up whilst I was standing on my snowboard. I can’t tell you how many times I was knocked off my feet by it. But it was worth the perseverance and although I was stiff as a piece of metal by the end of the day, I was satisfied with my new skill. If you’re going to Ruka to ski or snowboard you can rent everything need (apart from clothes) from the ski shop – even goggles. The guys in there were great – super friendly and helpful, especially when I told them that I was a beginner. They even helped me get the shoes on and taught me how to fasten them. Look out for discounts when you go – everything we did was half price on this particular weekend, making it a lot cheaper than it should have been. You can also change your equipment once for free – so if you don’t like skiing you can give snowboarding a go instead. There are plenty of cabins in the surrounding area and ours was only a five minute walk from two restaurants and the ski lift. 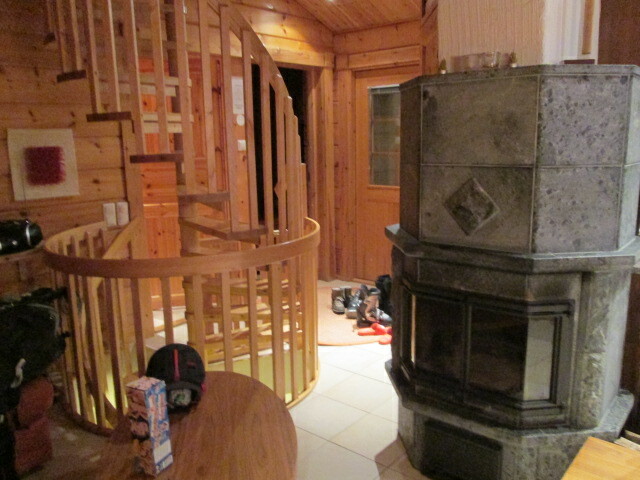 They’re cosy and great for a group of friends, with a nice big living area, dining table and kitchen. This is compensated for by quite small bedrooms, but they’re manageable for a weekend trip. And as a word of warning most of them have a ‘walk-in’ bathroom – there’s a shower curtain, but no door, so make sure you trust the people who you’re staying with! While the ESN students partied at night and nursed hangovers in the morning I had an exciting but relaxing weekend. With no internet, no assignments to worry about and beautiful surroundings I spent my days in good company and my nights chilling out with a good book (Ken Kesey’s ‘One Flew Over the Cuckoo’s Nest’, which I would highly recommend). The ESN leaders had arranged some activities and games but I was too tired to join in and the most social activity I managed was a game of Jenga. Even so, I met some new people and had a blast. I would happily return to Ruka with some friends in tow and do it all over again – and who knows, one day I might even manage an intermediate slope! I like to talk about Finland, a lot. An awful lot. Recently I received an email from the international office at my home university asking if I would be a tour guide for a visiting colleague in May. Would I ever? I jumped at the chance, sending him a long email with all my recommended foods to try and how great Finland is and how much he’d love it. Actually, I may have overdone it, and as I’ve not heard back I assume that I’ve frightened him a little with my enthusiasm. In a slightly more controlled manner I’ve written an article which gapyear.com have very kindly published, entitled ‘5 Things to do in Helsinki’. Even after only a handful of days spent there it was incredibly hard to pick only five, but I managed it and I’m really pleased with the finished result. Hopefully it will inspire a lot more people to visit and see the beauty that is Helsinki for themselves. You can check it out here, let me know what you think and if you like it then please feel free to share it! In other news, I’ve created a shiny new email account for all your questions and comments. Email me at finlandandback@hotmail.co.uk! Finnish is a great language – I love listening to it, I love speaking it, I love writing it. It might seem hard (and it can be at times), but it’s no harder than learning any other language. Stick with it, don’t be afraid to practice and keep listening and pretty soon you’ll have a few basic phrases down. 1. ‘Kuinka minä sanon _insert English word_ suomeksi?’ – How do I say _insert English word_ in Finnish? I love to learn new words and ways of saying things. As well as learning the language one has to learn how to use it – you can’t just translate word for word. If you’re not sure, ask! Finns will be glad to help. I’m still not very good at understanding spoken Finnish, not unless it’s spoken at a very slow pace! Coffee for day time, long drink for night. Long drinks are fizzy, sweet drinks with gin in them. The moost common flavour is grape, but my favourite is pineapple, yum! One of the most valuable phrases to know! 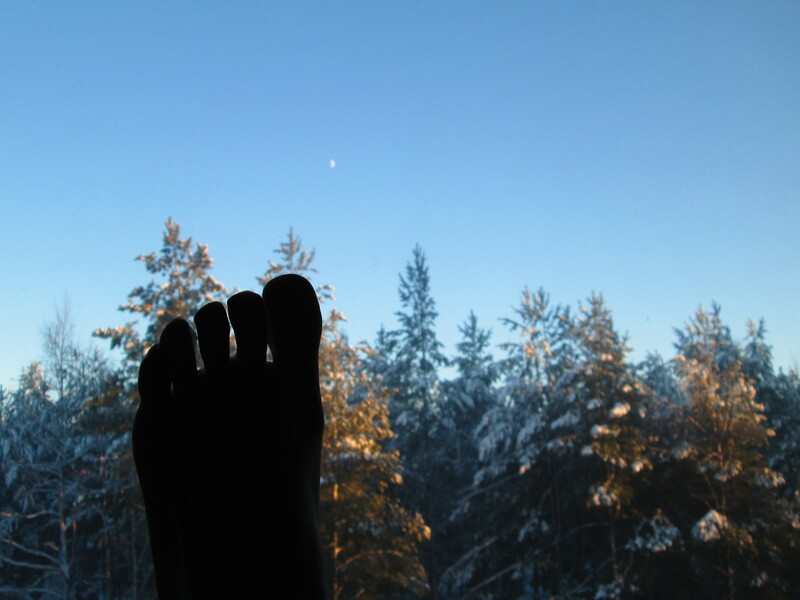 ‘Missä on’ can be used to ask where anything is, so it’s a nice all-round phrase to have. I say this virtually every time I part company with one of my Finnish friends. So there you have it, my most used Finnish phrases – what do you think? Have you ever tried speaking Finnish? To end I’d like to post the picture that I submitted to ‘toemailer’ which they have kindly published – it’s a really interesting blog so stop by and check it out! Hauska nähdä! While doing some research I stumbled across this great article that I’d never seen before – I thought I had read everything Finland-related in the internet! I also didn’t know about number one or number three – and I have had a Finnish guy ask for a bottle opener once outside a club, but we didn’t have one so he used the metal pole of the rope barrier instead! Clever. From that article it links to another one about Finnish ingenuity and it’s worth a read so I’m linking it here too. I took advantage of another bright day and went for a short walk around the neighbourhood – it was wonderful to be out in the sun listening to the birds sing and admiring the way the sun fell on the snow. I have been lucky enough to receive yet more followers to my blog and I have now reached the 1,000 views mark, thanks everyone for your kindness and support! Enjoy the rest of the weekend! Time to promote some Finnish music, which is hardly known and largely under-appreciated. The first artists are a folksy duo from Utsjoki and Tampere respectively. I first saw them at the ten year anniversary concert of the Sami Association in Oulu late last year and they blew my mind. They produced such soulful, beautiful music – it made one of my company cry. These talented guys have performed in various places around Finland and have created an excellent album – I think the best way to buy it is to enquire with them directly via MySpace or Facebook. This is Finnish reggae/ska at its finest. A great band who I stumbled upon, you can read about the experience here. In short I bumped into them at a bar, not knowing who they were, and they invited us to their gig – for free! They’re great guys and lots of fun to watch live! A pop idol winner this guy is your typical good looking, musically talented Finn. He’s a good, easy listen and I love his voice. This is one of my favourite songs of his. Listening to Finnish music is great when you’re learning the language because you get to hear it and practice your listening skills – put it on in the background and I bet you’ll pick things up without even realising. Once your Finnish improves it’s a great confidence booster to be able to recognise more and more words, try it! 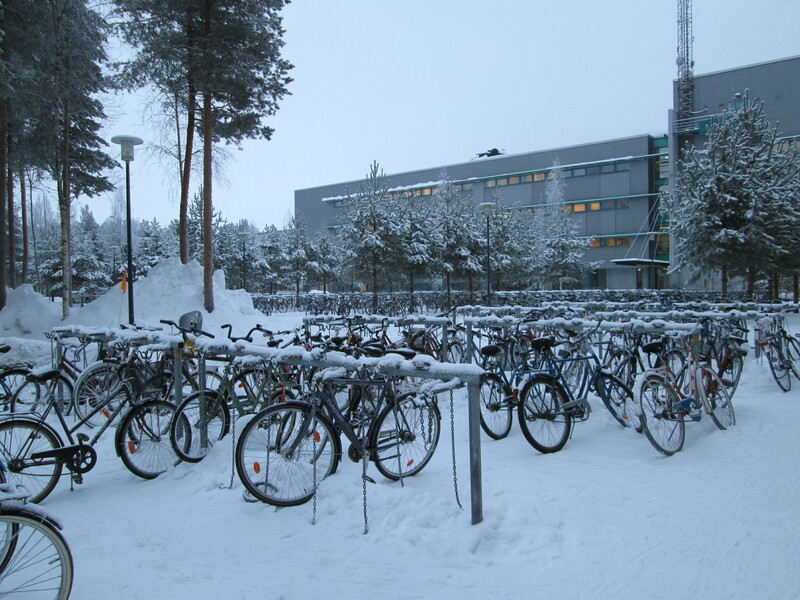 That’s Right, Everyone Cycles in the Snow! Apart from me, because I’m a scaredy-cat – and, honestly, I’m afraid of falling and ripping my jeans. Pathetic, I know, but I love my jeans. Anyway, this post is a hark back to one written by ‘ithinkthereforeiamsterdam‘ – ‘On yer bike!‘ which amused me greatly and opened my eyes to the bike culture of Europe. Honestly, when I used to think of Amsterdam or Finland I didn’t think ‘bike’ – well, now I do. In Finland cycling is for anyone. Little kids cycle in groups to school, students cycle to class, parents incorporate their kids into their lives by adding a child seat to their bikes. Old ladies cycle home from the store, their baskets heavy with shopping. In England cycling is reserved for health nuts and students too poor to pay for bus fare and many bikes are mangled by anti-social youths with little better to do with their time. Here in Finland there is a respect for bikes and the biker; it’s as much a part of their lifestyle as a trip to the sauna. Don’t get me wrong, bike theft still happens, but the majority of people get by with just a back wheel lock to secure their bike. They don’t even have to lock it to anything. 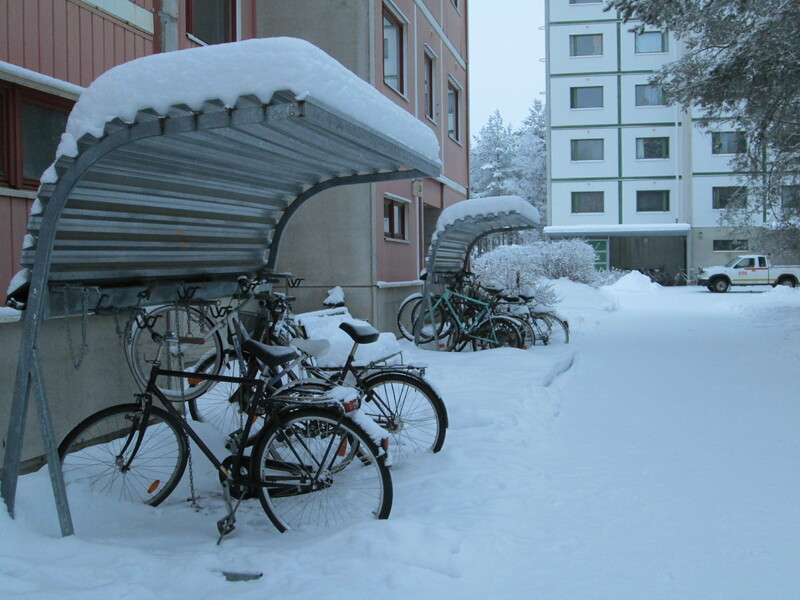 Throughout Finland there is a large network of cycle routes so you don’t have to risk it on the road and these are maintained throughout the winter, making bike travel possible through the seasons. Yes, it’s much colder and you have to be well prepared, but I’ve seen young kids bundled up to their point where only their eyes are still visible, and they’re still cycling. This website cites Finland as sixth on the list of ”Top 10 Countries With Most Bicycles Per Capita’ – that is, 60% of Finns are cyclists. It’s easy to see why; walking takes such an age on these straight, long roads and it’s so beautiful why waste the view with a car? Besides, it’s environmentally sound to ride a bike which follows the Finns love of nature and all things eco. Many prefer cycling to getting the bus – it’s quicker, cheaper, better and warmer than standing in the cold while you wait. Winter tyres – these allow for better grip, especially in early winter when there’s a lot of ice around. If you can’t afford them make sure you’re careful on corners, your breaks work and that you don’t pick up too much speed. Warm clothes – you’ll need really good gloves and boots to combat the wind, as well as a scarf to cover your face, a hat and ski trousers. Wind speed decreases the temperature dramatically so be sure to wrap up, even if it’s just a quick trip to the store! Bike Light and Reflectors – you want to be seen by both cars and pedestrians in the dark nights of winter, so think ‘Christmas tree’ and decorate yourself accordingly. A Great Big Thank You and Space For Feedback! Thanks to all of my followers and those who view my pages – it’s so kind of you all! It’s nice to know that the things I’m learning and experiencing are being passed on to others. I hope that you enjoy the blog and I’d like to take the opportunity to ask if anyone has any suggestions for future posts, things they want to see more of or know more about? Anything at all! 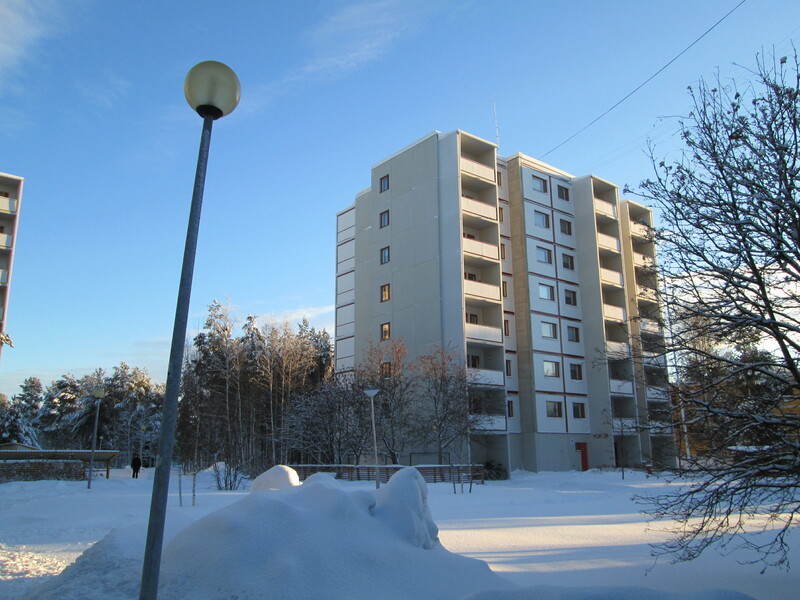 I also wanted to let you know that I’ve updated my ‘How Will I Survive in Finland?‘ page; I hope it’s a little more clear and useful to you all. It’s a nice cool -20 degrees today, but wunderground says that it feels like -29 because of the wind, yikes! Hope it’s a little warmer where you all are, thanks for reading!